WhatsApp Group Chat – How to manage higher compensation demands of candidates? In a world where things are changing rapidly, Talent Acquisition professionals face many challenges such as finding purple squirrels, trying to overcome high turnover rates, appealing to Talent looking for culture fit, retaining Talented folks and managing higher compensation demands are some of the many scenarios they encounter and handling them is another hassle. Fortunately, we @SourcingAdda realise this change and are focused on providing possible ways to overcome such challenges and thanks to one of our Bangalore group member’s Champa’s suggestion to discuss on, “How to manage higher compensation demands of candidates?” we are able to be of some assistance. Therefore, we’ve provided the conversation here under for your review…. Talent Acquisitionists encounter various types of candidates on a regular basis and dealing with candidates can be difficult especially when they ask for higher compensations that are unrealistic and are adamant about the compensation. So how does one tackle such candidates is what was addressed in the conversation above. Many practical alternatives were mentioned like mapping out your competitor’s company salary their company salary and the candidates current CTC to get an idea as to whether the compensation asked is reasonable or unreasonable. 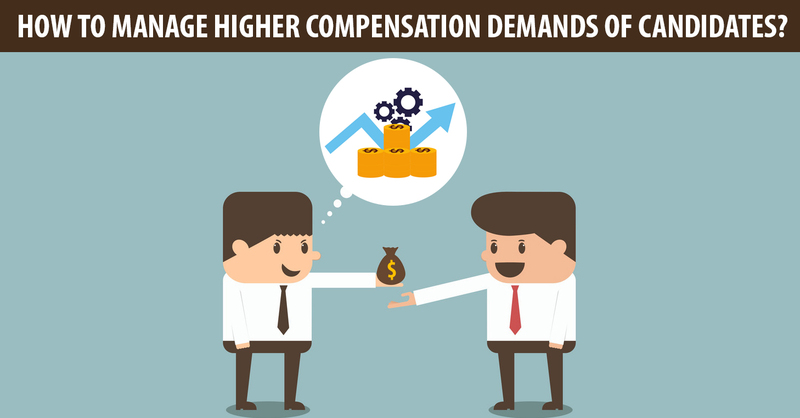 Moreover you can add different types of compensations as incentives to attract the desired candidate and get them to join your company like providing Restricted Stock Units (RSU), Employee Stock Purchase Plan (ESPP), Employee Stock Ownership Plan (ESOP), Hiring, Attendance, Sign – On or Signing Bonuses that can improve the Joining ratio. Other aspects like the skills that you are acquiring from onboarding a prospective candidate is another aspect to consider where compensation is concerned. If the purple squirrels you are onboarding are multi – talented folks or exceptional ones and stable as well then shelling out that extra cost seems worth your while and quite reasonable. Many organisations are constantly looking for talented folk to on board with little to less focus on the consequences of Hiring Managers Insisting on Immediate Joiners. 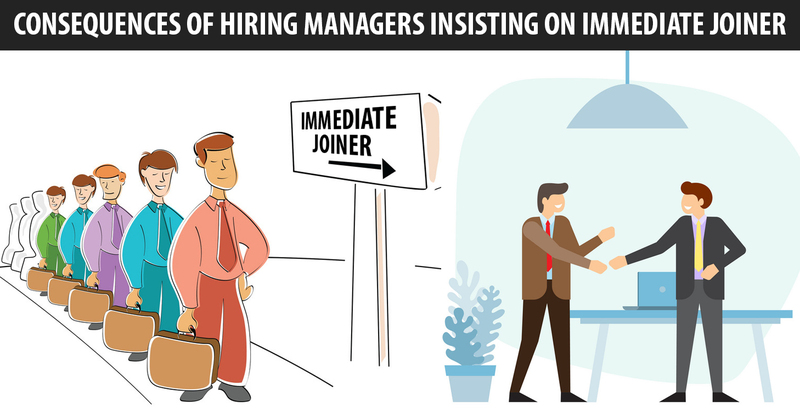 Most firms have a 3 month Notice Period while insisting on candidates being immediate joiners. Moreover both parties have a preference for Talent to enter and exit a company on a good note. So how does one especially Job seekers find middle ground in these extreme and contradictory cases where a job change is concerned? 1) How does it affect the recruitment lifecycle? The discussion above clearly indicates that there are always consequences when urgency is implemented and in this case candidates joining immediately. Candidates can opt for buying out their notice period but it is essential that they have a smooth entry and exit at every stage of their career. And it also applies to companies as well so preference should be given by both at both stages. Moreover, haste in hiring may have other adverse effects on the organisation in terms of extra efforts and additional time to rehire, or the hiring may cause one to remain disengaged with their colleagues, or the candidate requiring more time of training if the training is not effective. And insisting on urgency in joining when the clients show the opposite may lead to a talented catch being lost to a competitor and their company’s growth. Therefore, focus should be on all the aspects mentioned for the hiring process to be a smooth sailing. More importantly we’re sure you’d like to know more about the Tools to Automate the Employee Referral Program and you’d also like to find out how you too can contribute to these insightful interactions, then here’s what you can do in 2 simple steps, i.e. 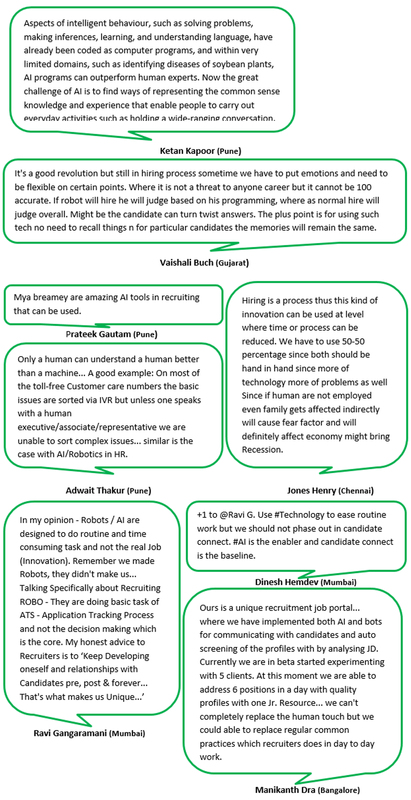 And we are thus able to do so thanks to one of our Bangalore group member’s Omar who suggested we discuss on, “What are the best ways to do Candidate Market Mapping?” We are sure you’d like to review what we’ve learned about it and update yourselves simultaneously hence we’ve highlight the same below…. 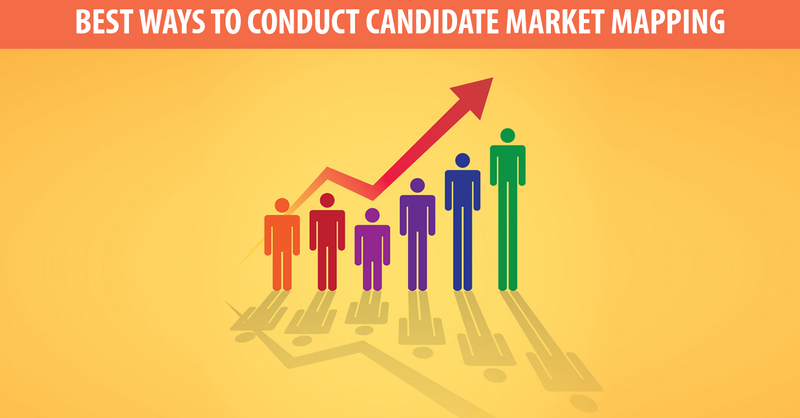 The conversation above has clearly highlighted the ways in which you can conduct your own Candidate Market Mapping. It has even showcased the benefits of conducting a successful Candidate Market Mapping. The inputs shared can help you in formulating one yourself to meet your specific requirements. Moreover it was very insightful on the aspects to be considered and why these particular aspects are important. When implemented correctly it can help Talent Acquisitionist’s like you get better results when an updated technique is utilised. Additionally, it even clarifies any queries one may have had about the topic discussed thus gaining a clear understanding of the concepts highlighted. WhatsApp Group Chat – How to maintain and manage referral data in a referral program? Maintaining and managing referral data can be a daunting task, when you have a lot of Candidate data that is not maintained properly which makes the hiring task difficult especially for Talent Acquisitionists. 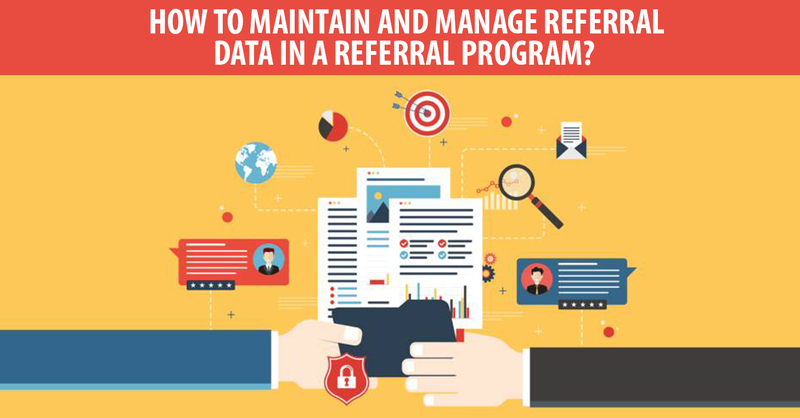 Most Recruitment professionals find the task of maintaining referral data a bit of a puzzler hence the question, “How to maintain and Manage Referral Data in a Referral program?” comes to the fore. A popular notion and one that most Recruiters are familiar with is by hosting a referral program. Conducting a referral program is by far the best way to hire and retain talent credentials for easy future access. It is also a great way to create pipelines of talent for ready access when a vacancy presents itself. Although, a referral program is quite effective when arranged in a systematic manner that makes accessing the data easy there are still some problems that one encounters with an ineffective and inefficient program. Getting referrals and maintaining a database of resumes not required at the present moment still poses a problem to most Talent Magnets. Luckily, we @SourcingAdda have foreseen such a development and have put in place certain measures to overcome such challenges by hosting discussions that address the concerns of Talent Acquisitionist. The discussion above was very insightful as it shed light on alternatives that one can use to get more referrals and strategies to maintain the referral data as well. Although, most organisations have an Applicant Tracking System (ATS) to maintain candidate databases they may not necessarily have a system in place to maintain employee referral data. In the absence of an effective system to maintain employee referral data then integrating such type of a system in to the existing ATS is a good option if it’s a possibility. If integration is not available then you can opt for any ATS software that also has the feature of referral data maintenance which is another alternative. Moreover, if attracting referrals is a concern then you can spread awareness about your IJP or a Referral Program that your organisation is conducting via traditional marketing techniques. Some alternatives that you can use to attract more referrals can be by giving employees an incentive such as a referral bonus. You can also create awareness by sending an email to all the employees or put up banners at the office canteen or run advertisements about the referral program and the referral bonus that they can opt for on a television if present in the office cafeteria. Apart from all of these aspects mentioned even giving a timely feedback on the referral status to the referred employee is essential to foster the referral Program and IJP. Therefore, be sure to stress on giving timely feedback on a referral to the referred as it will increase the possibility of generating more referrals when feedback is given. If employees, realise that you have an effective and efficient referral program or IJP they are more confident of the referrals being considered. If the information shared has been effective in helping you become more efficient and helped in creating a better and effective; in the maintenance of referral data then you’d like to know more about Candidates Rejected for Cultural Fitment to avoid on-boarding candidates that may quit the organisation due to company culture differences. And we are certain that you’d also like to find out how you too can contribute to these insightful interactions, then here’s what you can do in 2 simple steps, i.e. 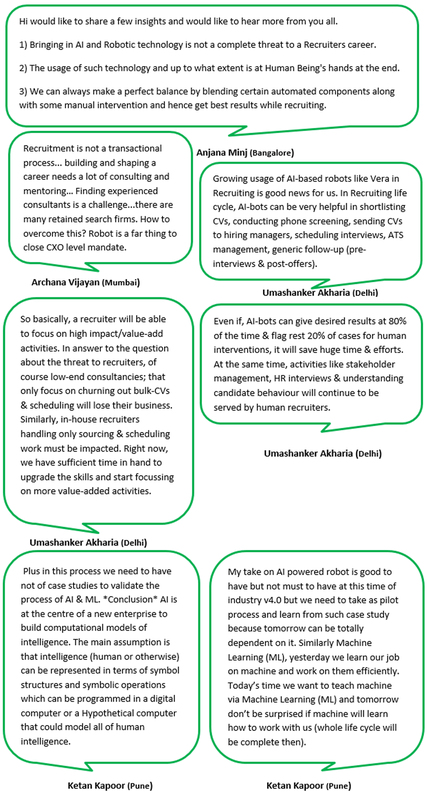 WhatsApp Group Chat – Do AI, ML and Robotic Recruiters like Vera pose a real threat to a Recruiter’s Career? 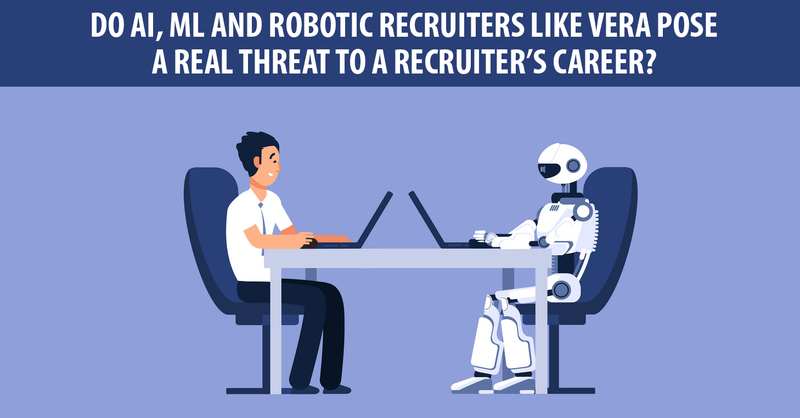 A popular topic of discussion in the recruitment fraternity is Artificial Intelligence (AI) and Machine Learning (ML) and how they impact the Recruiting process and whether AI, ML and Robotic Recruiters like Vera pose a real threat to a Recruiter’s Career? In an attempt to address this common concern that most Talent Acquisition professionals may eventually encounter we @SourcingAdda try our level best to help you prepare for the changing trends. And we do this by hosting discussions where awareness is created to help Recruiter’s alike be better prepared for the changes in the near future. The above discussion had very insightful inputs to add thus giving us a better perspective on the possible changes that we as Talent Acquisitionist can hope to encounter in the near future. If we follow the advice given and keep ourselves updated with the current trends we will be able to better prepare for the future. And by doing so we can be more efficient by automating regular tasks that require minimum attention and improve our chances of survival in an AI, ML, Robot Recruiter and data driven world we are most certainly going to enter. Nevertheless, we are certain that you’ve always wondered about how to reduce the Gender Pay Gap then go ahead and review the discussion to get some of your queries resolved while still adding to your knowledge. Moreover, we’re sure you’d like to learn more and thus are looking for ways to be more of an active learner rather than a passive one then here is something that you can do right now in 2 simple steps, i.e.